To be the best, we need exceptional people to work at MyRuby. The all important first impression that you make on us will be the one you’ll make on our most important people – our clients. So we’re looking for committed individuals who care about making an excellent first impression and have a desire to provide outstanding customer service. We look for people who have a warm and outgoing personality combined with a level of professionalism that meets our exacting standards. As a minimum you must have an excellent command of written and spoken English to GCSE grade C or equivalent. If you take a look at a job role and think you have what it takes to become one of our team and can agree to our Ruby Charter, please contact the Recruitment Manager and email your CV along with a covering letter of why you think you would be suitable for the role. Please note that MyRuby does not employ ‘Home workers’ and all employees are required to live within a 30 min traveling time of our Head Office in Colchester. MyRuby is an equal opportunities employer. Equal talent always means equal opportunity. 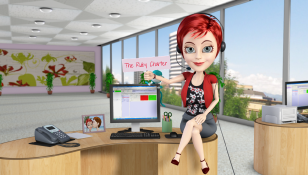 MyRuby provides a personalised telephone answering service for small and medium sized businesses all over the UK. As a Ruby Receptionist, you will be the main point of contact for anyone calling your clients, so you’ll need to be superb on the phone. This means combining a polite and friendly telephone manner with excellent efficiency. You’ll get to know your clients, manage their messages (and in some cases their diaries too) and become an integral part of their team. Working within our growing team in our modern Colchester office, you will be challenged daily with a varied and demanding workload. To help you deliver the best possible service, you’ll be supported by the latest technology. In return, we’ll offer you a competitive salary, training and great benefits like a health cash plan and a monthly performance bonus. To be considered for this role, a clear telephone voice is essential and you will be asked to complete a telephone interview. To perform at our high standards you will need excellent written English (minimum Grade C GCSE or equivalent), lots of common sense and a strong attention to detail. You will also be required to be organised, able to prioritise a busy workload, and have competent IT skills including Keyboard, Microsoft Office and Databases. But above all, you’ll know that providing excellent customer service has more to do with having a positive attitude and a sunny and charming personality than anything else. Please respond with your CV and a covering letter that shows why you would be a fabulous Ruby Receptionist. Please email your CV to the Recruitment Manager along with a covering letter that shows why you would be a fabulous Ruby Receptionist. As a MyRuby PA you will be an essential part of our business. You will represent MyRuby to our clients, and you will be representing their customers too. In return for your commitment and enthusiasm, you will be rewarded with an attractive salary and training, a fun working environment and great benefits like a health cash plan, performance bonus and a treat on your birthday. MyRuby only employs team players. Whilst you will have responsibility for your own group of clients, you will also look after your team’s clients when they are not available to take their calls. MyRuby PAs are the professional first image of their clients. You never get a second chance to make a first impression. So at the end of each and every call, the caller must be 100% confident their query has been handled effectively. Creating a detailed client record on our CMIS to accurately record key company and contact details and their call handling requirements. Updating and maintaining this information on a regular basis. Responding to client requests to change their call handling requirements, such as during a holiday period. Please email your CV to the Recruitment Manager along with a covering letter that shows why you would be a fabulous MyRuby PA. The first stage, if we think you have the qualities we are looking for will be for you to conduct a telephone interview which consists of 13 questions. would be a fabulous Ruby Receptionist.